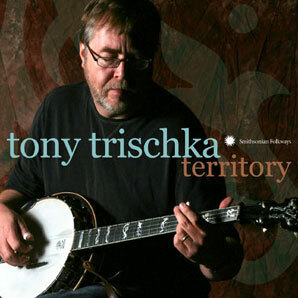 With fearless musical curiosity as the guiding force, Tony Trischka’s new album Territory roams widely through the banjo’s creative terrain. Twelve all-Trischka solo tracks explore a panorama of tunings, banjo sounds, and traditions. Nine selections partner Tony with fellow banjoists Pete Seeger, Mike Seeger, Bill Evans, Bill Keith, Bruce Molsky, and other guest artists to tap the creative potential of America’s signature musical instrument. 62 minutes, 21 tracks, 32-page booklet, extensive notes, photos.